The great "Barney Fife" Impersonator will be wandering the grounds all day on Saturday. Catch up with him for a very amusing little chat. The Bungy Jump will be back again this year to allow all the young and energetic to have a squealing good time. No child can resist the cuddly furry creatures in the petting zoo. You may not be able to resist them either. Included in this year's Zoo will be Peacocks, Chickens, Rabbits, Goats, Ducks and Miniature Donkeys. 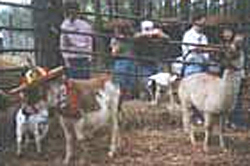 The Petting Zoo is now the BOB SMITH MEMORIAL PETTING ZOO and will remain FREE for all the little ones. Bob always loved children and enjoyed watching them have fun. It's always great to hear the sound of laughing children and that is what we aim for with fun activities that keeps them coming back time after time. We want your children to have as much fun at Calico Fort as you do!